Poor Ross Poldark. First he was taken captive during the American Revolution and spent some time in a French prison camp. He escaped and made his way back home to Cornwall, but maybe he should have stayed in America! During his absence, his father died, his uncle set about making deals to sell off family assets, his family home is falling apart, and his beloved Elizabeth has gotten engaged to his cousin Francis. Not the sort of homecoming he'd imagined! To be sure, Poldark had something of a shady past before leaving for the colonies. Still, it's hard not to feel sorry for a man who returns to a world that has so drastically changed. He immediately sets about trying to get one of his father's mines up and running again, and takes in a semi-wild country girl as a servant (who is meant to help the perpetually drunken groom and housekeeper he inherited from his father!). It seems that whatever he does, Poldark unwittingly makes enemies. The series plays out with duels, revolts, smuggling, murder, treachery and looming financial ruin -- things just don't go smoothly for Poldark! 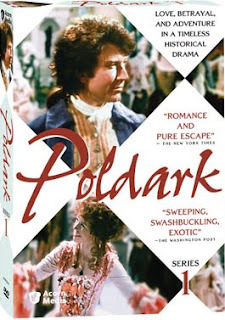 First shown on Masterpiece Theatre in 1975, the epic story of Poldark is now available on DVD. It has been called the British Gone With the Wind. The first season consists of 16 episodes of intrigue, romance and beautiful scenery! I appreciated the fact that you can turn on subtitles as you watch. This is always helpful, since I don't want to miss anything! Although the series is 35 years old, it doesn't feel dated at all. The costumes are lovely and the rugged Cornwall countryside is beautiful and bleak. One of the DVDs in the set also has a very interesting overview of the history and current situation in Cornwall. Thanks to Katie at Acorn Media, I have 3 copies of the first series to give away! To enter the giveaway, please leave a comment on this post telling me what your favorite costume drama. Or, if you don't have one, what is a TV series that you'd love to see again? Please be sure to leave your email in your comments so that I can contact you if you are a winner. The contest ends on Thursday, Feb. 25 and the winners will be chosen by random.org. I'll contact the winners who will have 72 hours to respond, or I'll have to choose another winner. I received a review copy of Poldark from Acorn Media, which in no way influenced my review. My favorite costume drama has to be the first series of Cranford. Or maybe North and South. It's a close second anyway. But I'm answering both questions, because the series I'd most like to see again, if only I could see it again for the first time, is Being Human. Simply the best television I've seen in many years. I guess Series 2 is being broadcast in the UK now - I really hope it is as good as Series 1. I would like to see the Wise Guy mini series again. LOVED North and South and Gone With the Wind. The Elizabeth movies and, if we can be creative here, Priscilla: Queen of the Desert. I loved North and South, my husband knows someone who was an extra in the series. My favorite costume drama was Marie Antoinette with Kirsten Dunst. My favorite is The Tudors. My favorite is either North and South or The Tudors. I was also a BIG fan of North and South. Thanks for the chance. I love the original "North and South" with Patrick Swayze, etc. But I also remember "Poldark" fondly and would love to see it again. I always enjoy a good production of Oliver Twist or David Copperfield. Please accept my entry. Thank you. I enjoyed both of the Cranston programs. I do love Gone With The Wind. Thanks! My favorite was Amadeus. Would love to see this! My favorite is Lillie about the famed actress Lillie Langtry. I liked Dangerous Liaisons a lot. But Poldark happens to be one of my all-time favorites. I saw it when it first came out on TV--wonderful series. My sis absolutely loved this series, which I called "Poldork" to irritate her. lol. I used to watch cop shows and miss The Rookies, Mod Squad and Adam 12. Thanks for having this contest. My sis will be thrilled when I win! I watched Poldark when it first was shown in America. I was 15, and fell head over heels in love with Ross. I like the Tudor series, but I would love to watch Poldark again! My favorite Costume Drama is Pride and Predjudice. I love the film and the outfits. I love the ladies of Cranford and the fashions in Anne of Green Gables. I loved Poldark, couldn't wait for each episode. How exciting that it is available again. Thanks for the cool give-away. I love Pride and Predjudice. I loved the irreverent 'Mall Flanders'. Gone With the Wind is a favorite for all the females in my family. I like Gone With the Wind. I love the BBC version of Pride and Prejudice. OMGosh! Poldark is FINALLY out on DVD? I have been waiting years for this. I was such a big fan as a young teen watching this series - it is my all time favorite series. Would love to be able to relive it again! Second favorite would be The Adams Chronicles, shown on PBS at roughly the same time. deleted prior comment because I didn't put in my email (even though it's inmy profile - I just love this series so much. i loved Beauty and the Beast which used to be on I think CBS. I tend to like costume dramas with "dramatic" leading ladies, so I would probably say my favorites are "Anne of Green Gables" and Francois Ozon's "Angel." I also might be in the minority, but I really enjoyed Sophia Coppola's "Marie Antoinette." :) Thanks for the chance to enter! I would love to see Twin Peaks again, thanks! I'd have to say The Tudors was a favorite of mine. There is no way that I could have a favorite costume drama, since there are dozens and dozens of Masterpiece Theater series that I would have a difficult time choosing from. Then, of course, there are other period piece mini series that have been produced that are not part of Masterpiece Theater. I would love to see Poldark again, though, I saw it when I was in college and enjoyed it immensely. I would like to see Gone With The Wind. I would have to say Pride and Prejudice. SUPER! Favorite costume drama - North & South. My wife loves Poldark and I haven't seen it yet, so it would be great for us. Thanks. I thought Midnight Caller was a great show and I'd love to see it again. A TV series that I would love to see again is In Living Color. I just found this site and I know it's too late for the contest but I just thought I would put in my choice. Like so many others Gone With the Wind is one of my favorites and Poldark is at the top of my list of costume drama's I would love to have on DVD, bt sharing that top spot is The Onedin Line. Some time ago they put out a total of 8 episodes but I would love to see them all again.